I get more and more bullish on gold with every passing week. 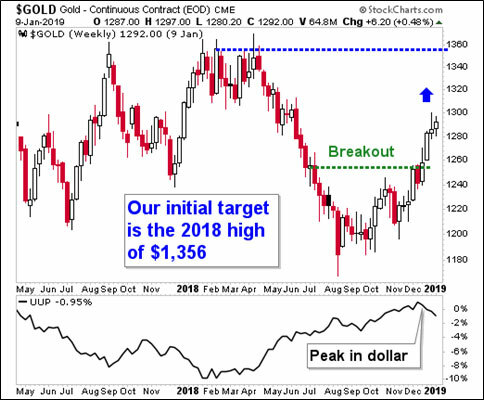 Heck, gold is officially in breakout mode. If you aren’t playing this move yet, I have a recommendation for you. My first chart is a weekly chart of gold itself. Gold broke out a few weeks ago. You can see it’s on a path to test its highs from last year. I believe it could go much higher from here. The key is dollar weakness. The mighty greenback, tracked on the bottom of the chart, has peaked. It is getting humbled fast as the U.S. Federal Reserve turns more dovish, and hopes for more interest rate hikes go out the window. Gold is priced in dollars, so as one goes up or down, the other usually moves in the other direction. But the dollar isn’t the only big factor moving gold. 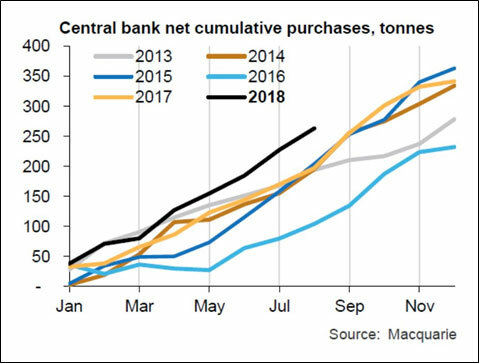 Another is central bank buying of gold. That’s started up again with a vengeance. Russia is a constant buyer, and just added another 36.6 metric tons in November. That’s on top of 29.9 metric tons Russia added in October and 37.8 metric tons in September. But it’s not just Russia. Kazakhstan added another 4.3 tons of gold to its reserves in November. Hungary, Poland, Mongolia — they’re all buying. Even China just added to its gold reserves for the first time since 2016. 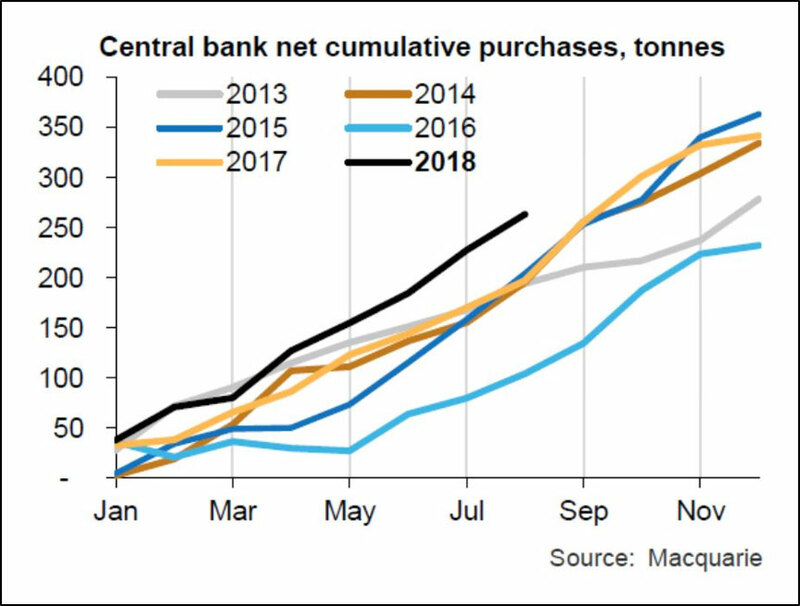 In all, central banks purchased 148.4 metric tons of the yellow metal in Q3. Central banks are the guys who tell us gold is a “barbarous relic” that we don’t need, right? So why are they buying so much of it? And they’re not the only big spenders. Let’s talk about ETFs that hold physical gold. On the way down, these are an extra weight on the gold price, because they sell into an already crowded market. On the way up, they can be rocket fuel, because they buy up gold that is already in demand. So let’s see what gold ETFs are doing lately. Since October, ETFs have scooped up more than 145 metric tons (4,661,858 troy ounces) of gold. ETF holdings have risen in sync with the gold price. So is the gold price driving demand by ETFs, or is it the other way around? We can have that “chicken or the egg” discussion another time. For now, let’s talk about how to play this move. I’m talking about gold miners. Here’s an interesting chart. 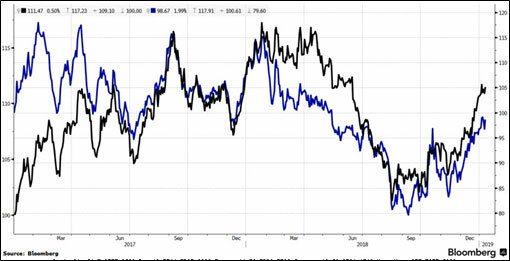 The blue line is gold; the black line is miners. You can see that miners are outpacing gold in this rally. That makes sense, because miners are leveraged to the underlying metal. It costs them less to mine gold than it does us to buy it. (The good miners, anyway.) 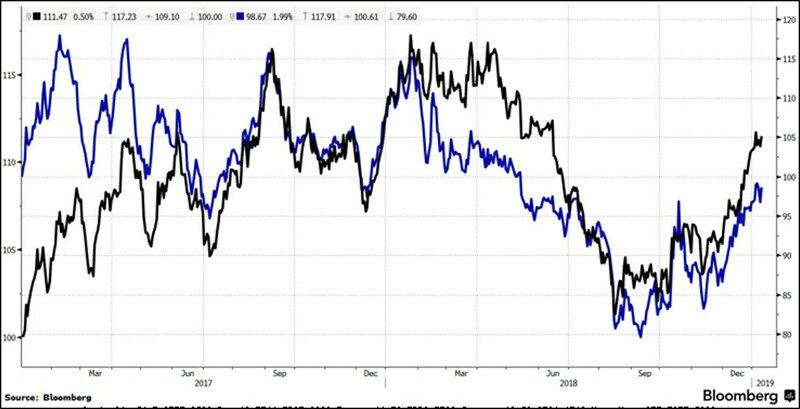 So as gold prices go up, their profit margins widen. Now here’s something interesting: Nothing travels in a straight line, right? 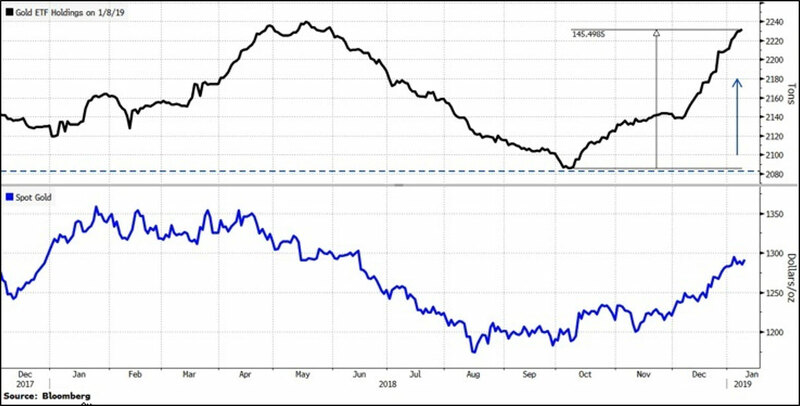 Well, the dollar is due for a bounce — so that means the metal is due for a pullback. And you know what that will be? A great time to buy. But I don’t suggest you buy the metal. Buy the miners. After all, miners are leveraged. They will probably pull back more than the metal. And that will be a great buying opportunity. 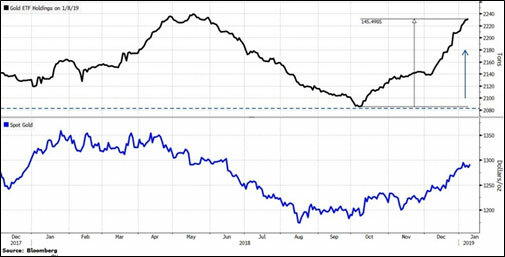 Previously, I told you why the VanEck Vectors Gold Miners ETF (NYSE: GDX) is a fine way to play this big rally. If you want even more leverage, consider the VanEck Vectors Junior Gold Miners ETF (NYSE: GDXJ). Full disclosure: GDXJ is in my personal portfolio. But it’s liquid enough that you, me and all our friends can’t push it around. Heck, it averages 14 million shares per day in trading volume. This golden profit train is building steam. The whistle will sound soon. You want to be aboard when it rolls out of the station. I’ve sent this along to our customer service team, someone should get back to you shortly. Thank you.